Schlotzsky’s, home of The Original® round toasted sandwich, has opened a newly designed restaurant in Phoenix with the “Lotz Better” rebranding efforts in mind. The new restaurant is located at 1-17 and Dunlap and features the “Lotz Better” concept. The “Lotz Better” concept was created to take this quick-service restaurant to a new level. When you visit the I-17 and Dunlap location, you’ll see how. The restaurant décor is hip and trendy, a far stretch from what most people would usually think of when hearing the Schlotzsky’s name. To play homage to the round toasted sandwiches, all of the décor has a “round spin”. Red and green round circles adorn across the walls, modern round chairs sit at each table, and even the light fixtures are round! Schlotzsky’s now appeals to a younger, more hip crowd now with this modern-retro atmosphere. Read more. QSR Magazine – July 2010 – Operators often lose sight of the importance of innovation in a down economy, but recession or no recession, consumers demand new options. At the end of 2008, Kelly Roddy was in the same boat as every other quick-serve executive. The economy was spiraling out of control around him, the average U.S. consumer’s wallet was shrinking, and his task was to figure out how to successfully weather the storm with his Texas-based quick-service sandwich chain, Schlotzsky’s. But while many executives decided that maintaining business as usual was the best way to get through the recession unscathed, Roddy had other ideas. As president of Schlotzsky’s, Roddy decided his company was going to zig while everyone else zagged, embarking on a rebranding strategy at the very moment when it seemed most risky to do so. Read more. 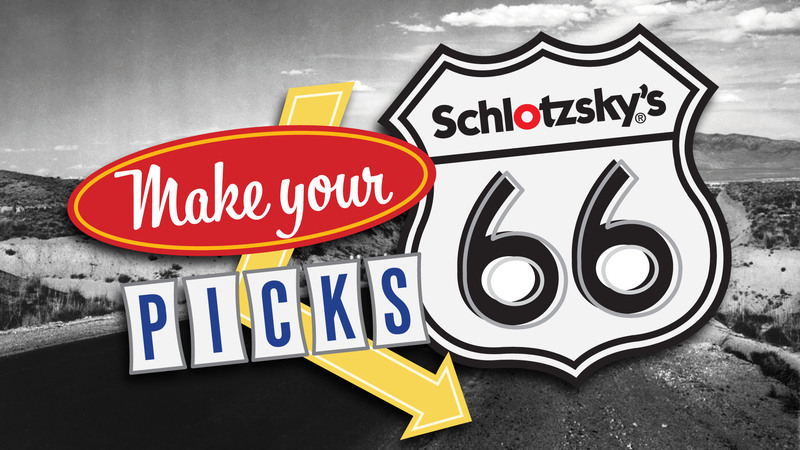 Schlotzsky’s wants to send you on a trip to anywhere in the contiguous US! You could win a 6-night family adventure, plus $1500 spending cash! Head over to www.MakeYourPicks66.com to enter. Three lucky 1st prize winners will get a weekend trip for 2 and $500 cash. Plus, you could win one of hundreds of $5 Schlotzsky’s gift cards, instantly! Dallas, TX – Schlotzsky’s, home of The Original® round toasted sandwich and famous Fresh-from-Scratch® buns, announced the addition of the cutting-edge Coca-Cola Freestyle®, The Coca-Cola Company‘s new proprietary fountain dispenser. The Freestyle was installed in four Schlotzsky’s locations in Dallas/Ft. Worth, making Schlotzsky’s one of the first DFW area restaurants to offer the state-of-the-art fountain. The sleek, stylish new fountains are touch screen operated, enabling consumers to select from 106 regular and low-calorie beverage brands – including many varieties of waters, fruit-flavored beverages and sparkling beverages that, prior to the arrival of Coca-Cola Freestyle, were not available in the U.S. The dispenser uses unique, proprietary PurePour Technology™ and has the capacity to dispense 106 beverage varieties in the same amount of space as a standard eight-valve machine. “We are truly excited to be a partner of the ‘Lotz Better’ Schlotzsky’s and to provide Dallas and Fort Worth guests the opportunity to experience this one-of-a-kind innovation,” said Gene Farrell, vice president, Coca-Cola Freestyle, Coca-Cola North America. The addition of the Coca-Cola Freestyle machine is the latest in Schlotzsky’s efforts to reinvent their brand to an “All ‘Round ‘Lotz Better,” look. The reinvention includes a new prototype restaurant featuring vibrant colors, playful slogans, contemporary furniture and artwork, and a partnership with sister company Cinnabon that offers franchisees two brands under one roof. Schlotzsky’s also introduced a new service model where crew members hand-deliver food to the tables. Since 1971, Schlotzsky’s has been the home of The Original® toasted sandwich. The menu has evolved with customers’ tastes to include the highest quality sandwiches, pizzas, salads, and soups available today. With more than 350 locations worldwide, Schlotzsky’s is the fast-casual choice for a quick, healthful, and fresh dining experience. Schlotzsky’s is enjoyed around the world, with restaurants in Turkey, China, Saudi Arabia, South Africa, Costa Rica, Jordan and Kuwait. Schlotzsky’s is owned by FOCUS Brands Inc.®, the franchisor and operator of over 2,200 Carvel®, Cinnabon®, Schlotzsky’s®, Moe’s Southwest Grill® locations and Seattle’s Best Coffee® on certain military bases and in international markets. For more information, visit www.Schlotzskys.com. The Coca-Cola Company is the world‘s largest beverage company, refreshing consumers with nearly 500 sparkling and still brands. Along with Coca-Cola, recognized as the world‘s most valuable brand, the Company‘s portfolio includes 12 other billion dollar brands, including Diet Coke®, Fanta®, Sprite®, Coca-Cola Zero™, vitaminwater®, POWERADE®, Minute Maid® and Georgia Coffee™. Globally, we are the No. 1 provider of sparkling beverages, juices and juice drinks and ready-to-drink teas and coffees. Through the world‘s largest beverage distribution system, consumers in more than 200 countries enjoy the Company‘s beverages at a rate of nearly 1.6 billion servings a day. With an enduring commitment to building sustainable communities, our Company is focused on initiatives that protect the environment, conserve resources and enhance the economic development of the communities where we operate. For more information about our Company, please visit our Web site at http://www.thecoca-colacompany.com.